Rugged alpine peaks, rare wetland habitat and old-growth cedar-hemlock forest make up the South Selkirks. 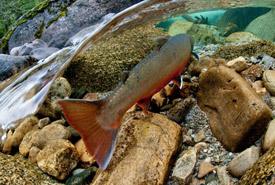 The Nature Conservancy of Canada (NCC) works from mountain top to valley bottom in this internationally important natural area, located in the West Kootenay region, between Creston and Nelson. Residents of the South Selkirks largely depend on the goods and services supplied by the local, natural resource-rich ecosystems. 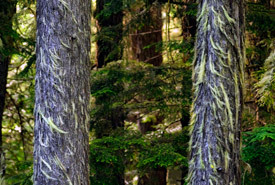 The highest diversity of trees in BC and 265 bird species can be found within the natural area. The South Selkirks Natural Area includes the Creston Valley. The valley supports the only known breeding population of northern leopard frogs in BC and the southernmost mountain caribou herd in Canada. It also provides habitat for a threatened population of grizzly bears. Thirty species nationally listed as endangered, threatened or of concern are found here. Habitat fragmentation caused by roads and highways, as well as urban and residential development, are obstacles for conservation work in this area. With the protection of large connected networks of ecologically significant land, NCC is working to conserve the integrity of the unique habitats found here, to improve the chances of survival for the wildlife that the land supports. NCC became involved in the South Selkirks with the acquisition of Darkwoods in 2008. At 136,000 acres (55,000 hectares), Darkwoods is the largest private land purchase for conservation in Canadian history. It cemented NCC’s role as an important land manager in the region. Darkwoods remains NCC's largest conservation area in the country.